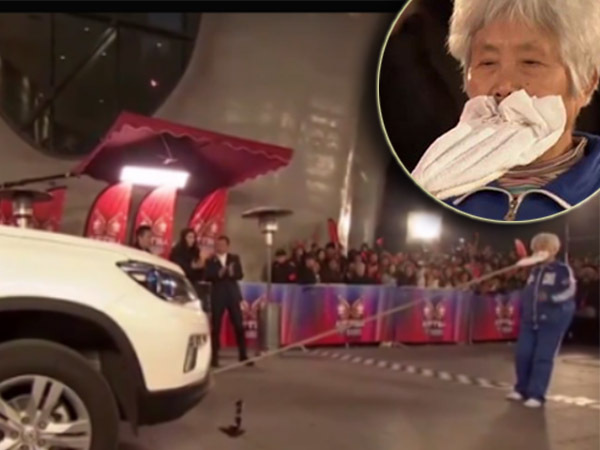 A Chinese version of Britain’s Got Talent saw an 81 year old Wang Xiaboei pull a one-tonne car using only her teeth. Could this be the world’s strongest grandma? Amazing Chinese, the Chinese version of Britain’s Got Talent saw an 81 year old Wang Xiaobei pull a one-tonne car using only her teeth. “I have a healthy body and healthy mind and I don't think there's any difference between how I feel now and how I felt when I was younger,” Wang explained on the show. The pensioner is seen biting down on a rope connected to a one-tonne car containing three people- her friend, grandson and his wife. She then proceeded to drag it along the floor in front of the speechless audience. Amazingly, it took her a mere 38 seconds to drag the car across the finish line. “It was amazing to watch. I thought her teeth would fly out, but they didn’t and she even seemed to be doing a little dance as the crowd clapped,” said one stunned viewer.